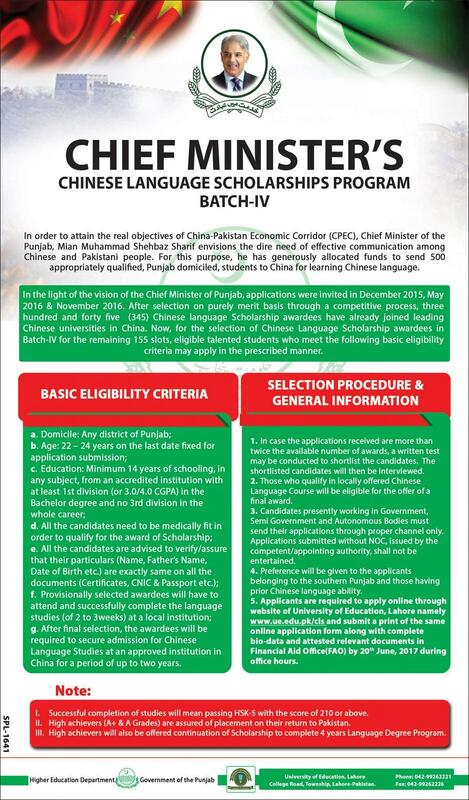 Chief Minister (Punjab) Scheme for Chinese Language Scholarships Program Batch IV official released for 500 candidates to learn Chinese Language in China. In order to attain the real objectives of China-Pakistan Economic Corridor (CPEC), Chief Minister of the Punjab, Mian Muhammad Shehbaz Sharif envisions the dire need of effective communication among Chinese and Pakistani people. For this purpose, he has generously allocated funds to send 500 appropriately qualified, Punjab domiciled, youth to China for learning Chinese language. In the light of the vision of the Chief Minister of Punjab, applications were invited last year in December, May & November. After selection on purely merit basis through a competitive process, Three hundred and Forty Five (345) Chinese language Scholarship awardees have already joined leading Chinese Universities in China. Now, for the selection of Chinese Language Scholarships awardees in Batch-IV for the remaining 155 slots, eligible talented students who meet the following basic eligibility criteria may apply in a prescribed manner. We envisage to prepare a contingent of people who can work as interpreters between Pakistani and Chinese individuals, groups or organizations desiring to engage into negotiations on wide ranging matters of bilateral interest. These people will have the ability to facilitate effective and accurate formal communication between a party that speaks Punjabi, Urdu or English and the Party that speaks Chinese. By the virtue of their responsibility, people will need higher level of proficiency in their primary language as well as in Chinese language further supplemented with significant depth & breadth of knowledge in at least one area of high mutual interest as determined by the current concentration of trade/business between the two nations in order to fulfill the needs of these high value negotiations. Hanyu Shuiping Kaoshi (HSK) is a system of standardized Chinese language tests conducted internationally to measure various levels of proficiency in Chinese. This system of exams is an initiative of Hanban, the headquarters of all Confucius Institutes, and helps determine, in an objective manner, a learner’s ability in Chinese language in terms of the ability to understand, speak, read and write. HSK measures the proficiency in Chinese Language in six levels (Level-1 being the Beginner’s or Basic and Level-6 the Advanced). In general, HSK-1 and HSK-2 are divided into listening and reading sections only and test 150-300 of the most commonly used characters and grammar structures. The HSK-3 and HSK-4 include listening, reading and writing and test 600-1200 characters and grammar structures. The HSK-5 and HSK-6 are also divided into listening, reading and writing sections and test 2500-5000 commonly used words and grammar structures. An average student studying Chinese is expected to take HSK-3 or HSK-4 and most of the universities require HSK-4 with a score of 200 or more to qualify for admission to Bachelor’s Degree Programs in Engineering, Business or Economics etc. At this level, students will be able to have basic everyday conversations. The students who would like to use Chinese professionally are expected to take HSK-5 or HSK-6. Applicants are required to apply online and submit a print of the same online application form along with complete bio-data and attested relevant documents in Financial Aid Office (FAO) by June 20, 2019 during office hours. Last date for registration online and application form submission is 20th June 2019. Address: Financial Aid Office, University of Education, College Road Township, Lahore, Pakistan.